We are proud to present this well presented and generously sized two bedroom ground floor apartment situated in this popular location. The property is presented to a good standard throughout and occupying a favourable position overlooking the well maintained communal gardens. The property is located close to all local amenities, surrounded by reputable schooling and is convenient for the local transport links. Furthermore the property boasts an allocated parking space. Briefly the property comprises of an entrance hallway, fantastic lounge, spacious dining kitchen, two double bedrooms and house bathroom. Very rare do opportunities like this come available, so book your viewing today!! ENTRANCE HALLWAY The hallway is welcoming and spacious and benefits from a wall mounted radiator. Internal doors lead to the lounge, kitchen diner, both bedrooms and house bathroom. LOUNGE A spacious reception room with double glazed windows to two aspects allowing excellent levels of natural light. The lounge benefits from an electric fire with stylish surround giving this room a focal point and cosy feel. The lounge has plenty of space for a number of pieces of comfy furniture, the perfect place to sit back and relax. Furthermore the lounge has a wall mounted radiator and stylish laminate flooring. KITCHEN DINER The kitchen is well presented with an array of modern and stylish wall and base units with complimentary work surfaces. The kitchen boasts an integrated fridge freezer, dishwasher, electric point for cooker with four ring hob. There is plumbing for a washing machine with single stainless steel sink and drainer. Furthermore the kitchen is decorated with tiling to the walls and easy clean flooring. The dining area offers a great amount of versatility. The room could either be used as a formal dining room or second lounge depending on your lifestyle. This room is the perfect place to entertain family and friends. The dining space benefits from a wall mounted radiator and double glazed window. MASTER BEDROOM A generous sized double bedroom with fitted wardrobes. 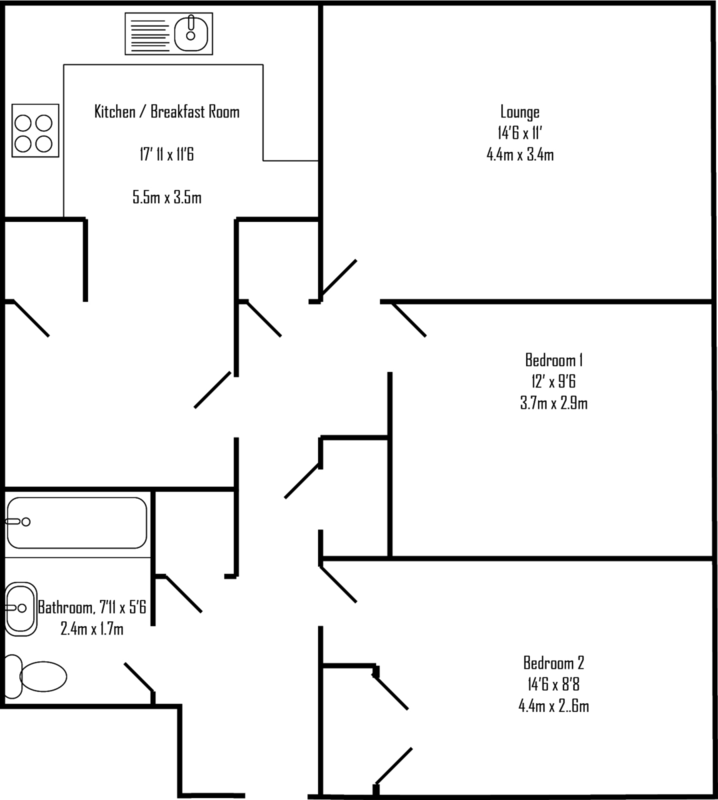 There is still plenty of space for a double bed and free standing furniture. Furthermore the master bedroom has a double glazed window and wall mounted radiator. BEDROOM TWO Another generous sized double bedroom with space for a double bed and furniture. There is also a fitted wardrobe, wall mounted radiator and double glazed window. HOUSE BATHROOM A well presented bathroom which comprises of a two piece suite in white including a panelled bath and pedestal wash basin. The bathroom has a wall mounted radiator and tiles to the walls. SEPARATE WC Separate from the bathroom but could be made into one room. The WC has tiling to the walls and a wall mounted radiator.